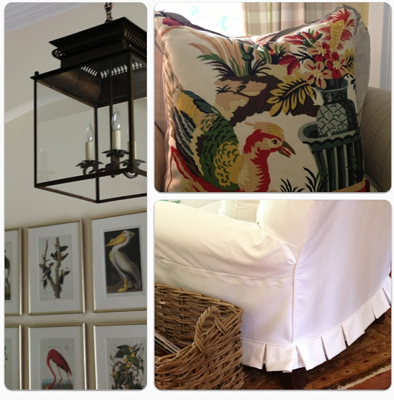 I have been using some of my favorite things on a recent project: buffalo check, plates on the walls, white slipcovers, Audubon prints and baskets! And of course my beloved Bolton lantern! Fabric is by Brunschwig & Fils and I admit its pricey but we used just a few yard to get a great accent! I blogged about the fabric here. 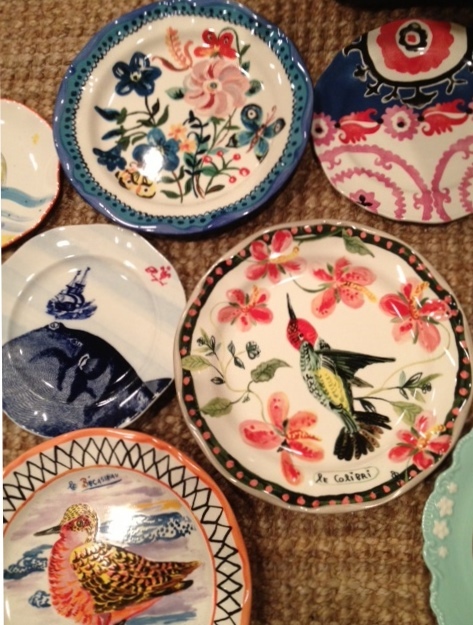 These fun plates from Anthropologie are going to make great art over the kitchen table! 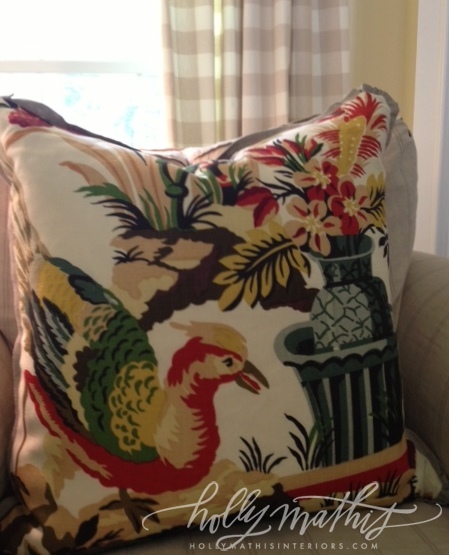 So fun and the color carry our colors from the bird fabric through the space! I was telling the client I hate to use those traditional plate hangers that huge the sides of the plate but I just trust those other 3M type hooks that go on the back…am I crazy? Any recommendations for certain hooks to hang plates… Like I said I trust these but don’t love that they show! I want to go here but I am fearful..ha! 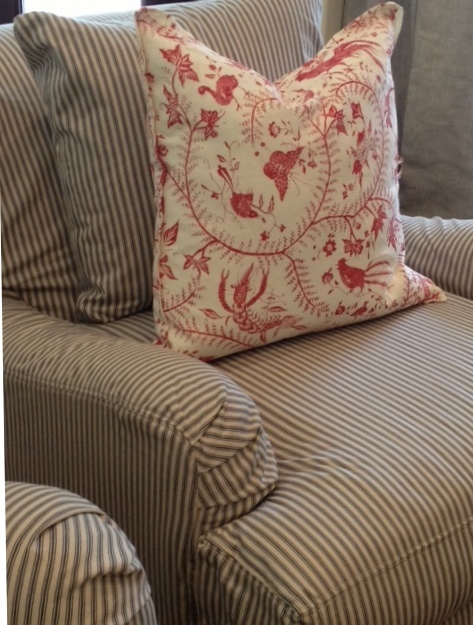 But I am not fearful of mixing fabrics..love these ticking chairs from Pottery Barn paired with custom pillows out of Quadrille cirrebon fabric! This is a project that has been so fun..we are just waiting on some Circa pendants and new Quatrine slipcovers. Hopefully I can show the big picture soon! In the meantime, a bit of housekeeping. If you have sent an inquiry to us through the request a consultation page and have not heard from us please let us know asap either by emailing clients@hollymathisinteriors.com or leave a comment on any blog post. Apparently that page has not been working properly and I want to be sure and let you know if you have not received a response it is because we have not been receiving those emails. Leslie and I always try to reply to every question and request for information. Please let us know if you have not received communication. Holly, those disc hangers work GREAT. I’ve used them (in fact, had an offer on my blog long ago for free shipping) and they are still holding up. They are AWESOME!! I agree! The disc hangers are awesome. Super strong. I have some heavy platters hung in my kitchen with them and they’ve been up for two years now. I check once in awhile and they are still adhered on the plate. Love them! One piece of advice–follow the instructions exactly and let them dry on the plate at least overnight. Then they are nice and secure. Love you sweet friend! And you have a Leslie!?!?! We have to catch up. I love the buffalo checked and the pretty floral! It has my heart. I love those plates!! they are so pretty! I hear ya about the plate hangers they really aren’t my thing either! I have resorted to hot gluing brackets on the back of my plates and hanging them with a good ole’ sturdy nail.. should I even be admitting to this… ok I just did. I may get and F in interior décor for this little trick but Its worked so far. No plates have crashed and burned yet and I have some pretty hunky ones hanging this way. Loving this space though can’t wait to see it when its all done! Holly, I have also used those round disc hangers. I used them to hang plates and platters in my kitchen area. It has been up for over a year and worked great! I was nervous at first too! This space is going to be amazing! Love the striped chairs-Carlisle? Can this please be my house?! I love every single sneak peek of this project. Can’t wait to see the big reveal! Love the adhesive disc hangers. Can buy them at Hobby Lobby with a coupon. I have a large oval ironstone platter hanging for two years plus now. The wonderful thing is if you don’t want them on your plates anymore you just soak them. and they come off. The wire ones used to scratch the edges of my delicate antique plates. Love the fabric and colors in this post. I collect majolica and all of my plates are hanging with those discs. They are great!! They also remove cleanly without damage to the plate,when you are finished with them. LOVE! Everything you do!!! I use the adhesive plate hangers all the time. In fact, I have several plates that have been hanging for 10 years with no problems. If you follow the directions, you should have no problems. By the way, I live in very hot and HUMID south Louisiana. Where is the buffalo check fabric from? I have been looking for a nice scale check fabric for a project I am working on. Holly, stunning!!! I can’t wait to see it all come together… PS.. I have left my purse, passport, DL and cash in a cab!!! You’re not alone my friend! The plates are beautiful as well as the rest of the pictures in this post. 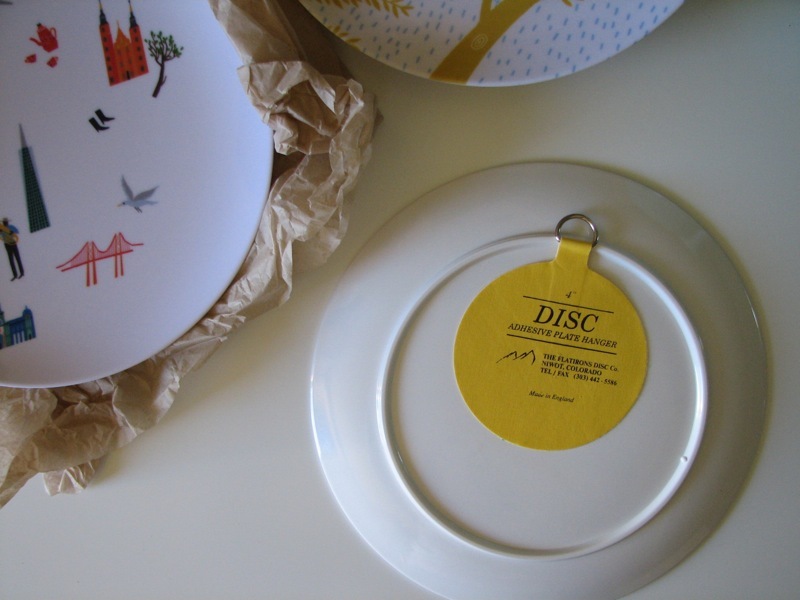 I have never tried the yellow disc hangers, but have heard good things about them from others. I personally prefer the traditional hangers. Maybe it’s because deep down I am a granny look lover! Love, love the chair and fabrics in these pictures. The adhesive plate hangars would make me nervous too. The other day I bought 3 cute vintage plates about 7″ in diameter. I took some Command velcro thingees, cut them into about 1″ by 1/2″ and stuck them on the back of the plate, four of them on the rim. They are very secure on the wall and have been up about 2 weeks or so. I think they’re on for the haul. Just thought I’d pass that little tidbit along. Okay. Time for some CHOCOLATE!! Love…every. single. item. 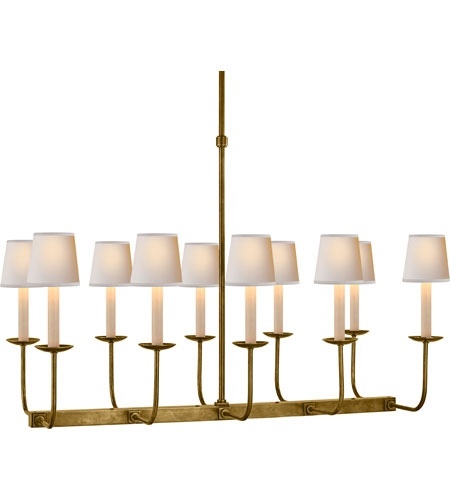 (except the qwirky chandy at the end – who knows why – LOL). And me…I have a bazillion of those wire plate hangers too. They work. I’m happy. But, I’d be dancing to hang some of those plates on my wall. Hi Holly….I’m late to the party on this one, but thought I’d throw in my 2 cents…we have used the yellow disc hangers (bought them off of Amazon) and they work great. I also like that you can trim them to fit the plate if need be. No problems with falling dishes (even big ironstone dinner plates from Anthro) or trouble getting them off when they were no longer needed. Fingers crossed!